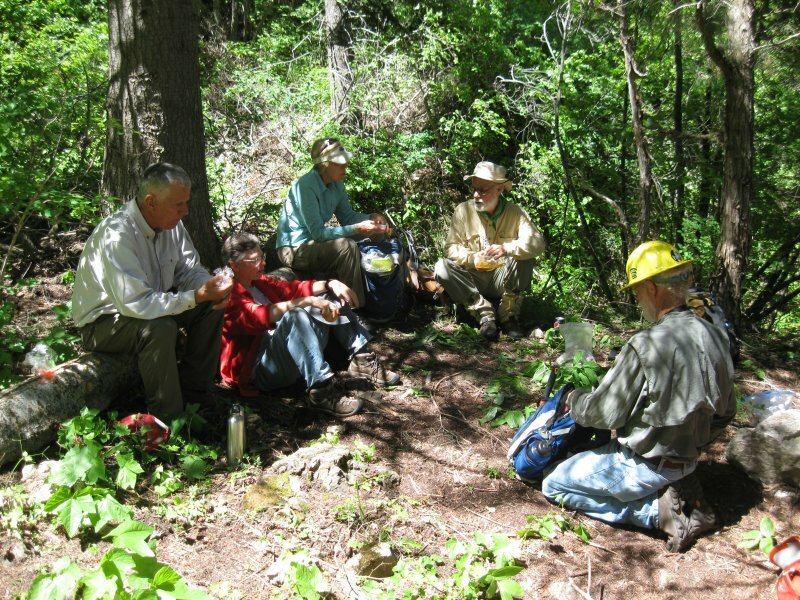 Organized by the US Forest Service, eight Cache Hikers attended a trail maintenance training session held at Spring Hollow: Alex, Stephanie, Jane, Dave W., Roddy, Gordon, Ron F. and Kent. The Cache Hikers were invited because we volunteered to "adopt" the Card Canyon East and Crimson Trails. Participants also included the Presbyterian Church (Wind Cave Trail), the Likin' Hikin' Ladies (Temple Fork Sawmill Trail) and there were a few others, too. 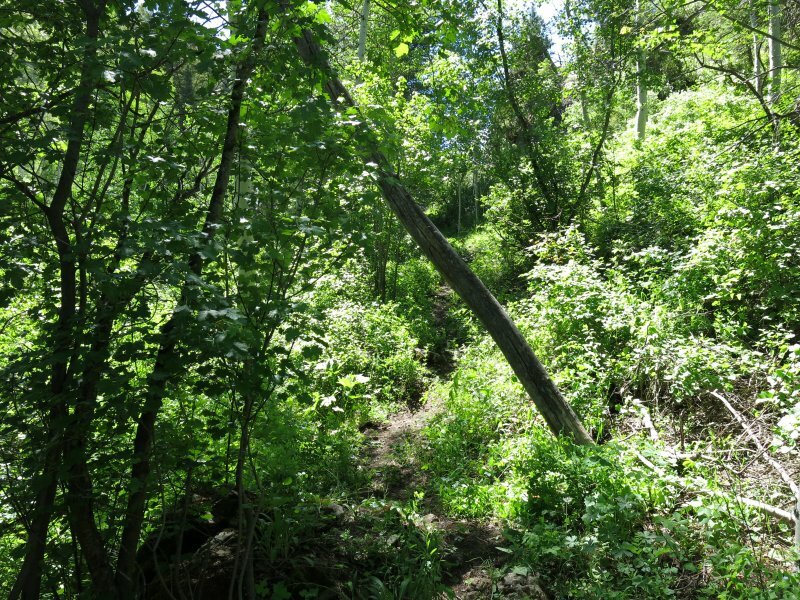 We learned about basic tool safety and trail maintenance practices along with "Leave No Trace" principles and guidance on controlling trail weeds (below). We scheduled this activity for a week day to attract a different group of volunteers. In part due to the unsettled weather, however, only Jane and Dave W. showed up! We walked the half-mile to the archery range after driving to the gate in Card Canyon, and then another mile up the Card East trail to resume our brushing work from last year. On the way up we cut out three logs that had fallen across the trail and we rooted out some dyers woad that was growing along the trail. The wet soil from last night's rain made this an easy task, but we know that woad plants uphill from the trail will spread seeds back into this area. 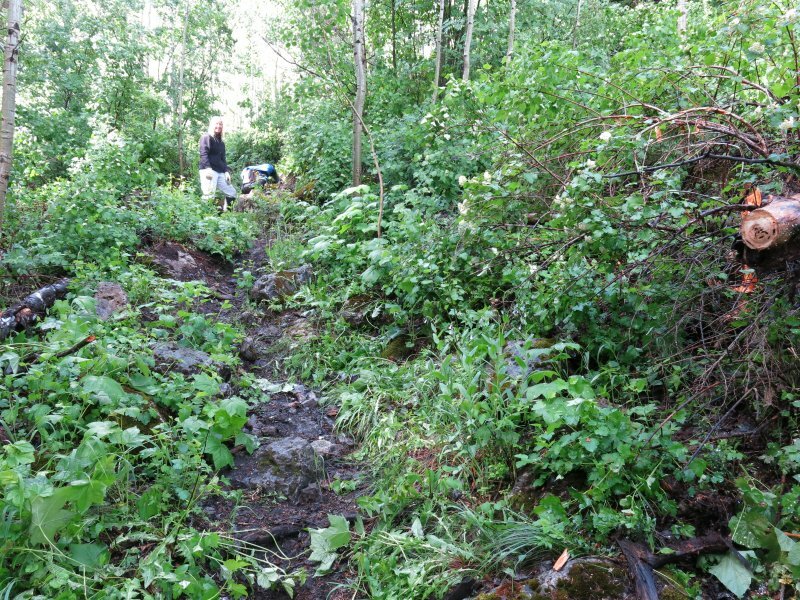 We brushed another 200 - 300 feet of trail, but there is a lot more to go! It didn't take long to get soaked as we worked in the the wet foliage from last night's rain, and more rain that fell while we were there didn't help. We kept on working in spite of soggy gloves, and water running down our legs and into our boots made for squishy walking during our mid-afternoon hike back out. Fortunately rain coats kept our upper bodies dry, and moderate temperatures kept us from getting chilled. We enjoyed solitude, wildflowers and great views in spite of the inclement weather. Eleven Cache Hikers helped out with this maintenance activity: Jane (the leader), Ron F., Joanne, Brenda, Dave P., Dave W., Roddy, Gordon, Joe, Viviane and Shelley. 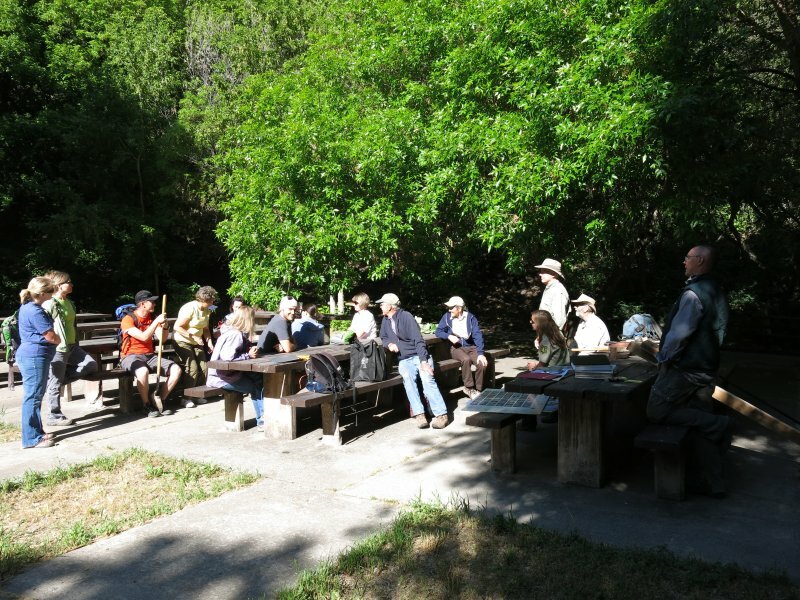 We assembled into three vehicles and drove 10 miles up Logan Canyon, arriving at the Card Canyon gate, where Jane explained safety precautions and work goals for the day. We started up from the gate about 8:50, arriving about an hour later at our work area. We spread out along the trail, trimming woody vegetation from the trailside using hand pruners, loppers, and pruning saws. 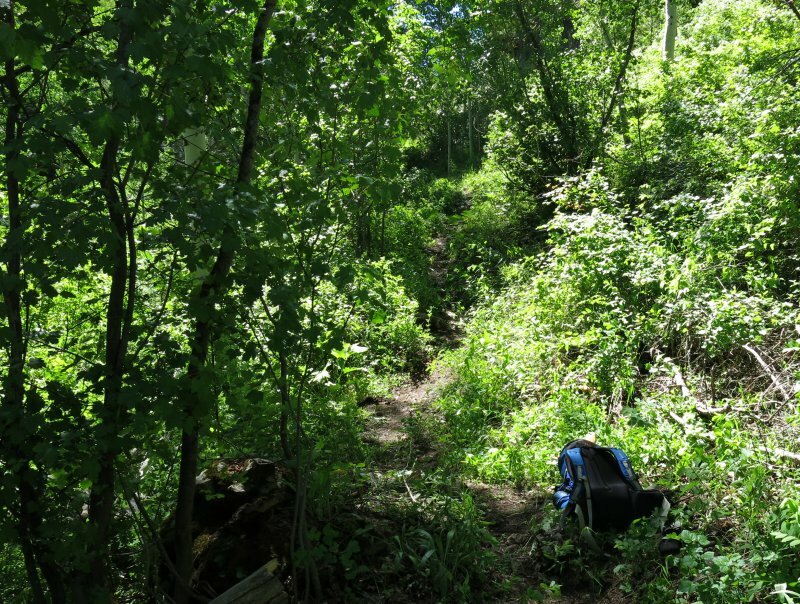 Progress was slow in the heavily overgrown areas, but things sped up a bit when we got to more open sections of the trail. 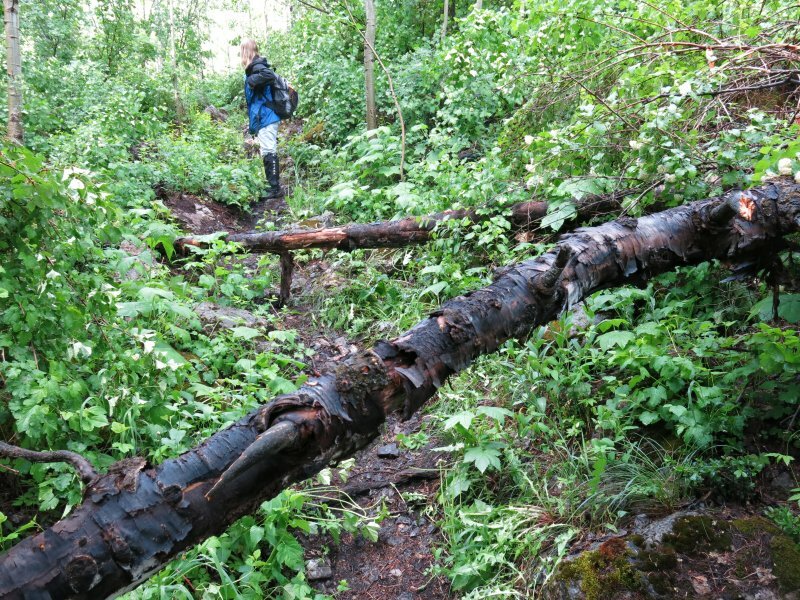 We also pulled down a "hazard tree" that was leaning over the trail. We were treated to views of nearby rock formations and distant hills, the soothing sound of flowing water and the calls of a soaring red-tailed hawk. About 11:30 we called it off for the day. Five people kept on going back to the vehicles to facilitate an earlier return to Logan, while the rest enjoyed a leisurely lunch at the "tree room". Everyone was back in Logan by 1:30. With about 1/2 mile more to the standing stone, several people expressed an interest in additional maintenance trips to reach this objective by the end of the season. Thanks to Jane for the narrative and photos, with more photos and GPS work by Dave. Lunch at the "tree room"
Trail weeds are spread by people and their animals. These annoying plants can greatly reduce the trail user’s enjoyment and they crowd out native plants, but they can be controlled. Houndstongue and burdock (below) are of special concern on area trails. Do not let houndstongue and burdock reproduce! 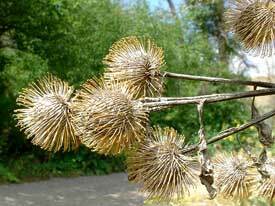 Do not spread houndstongue and burdock! 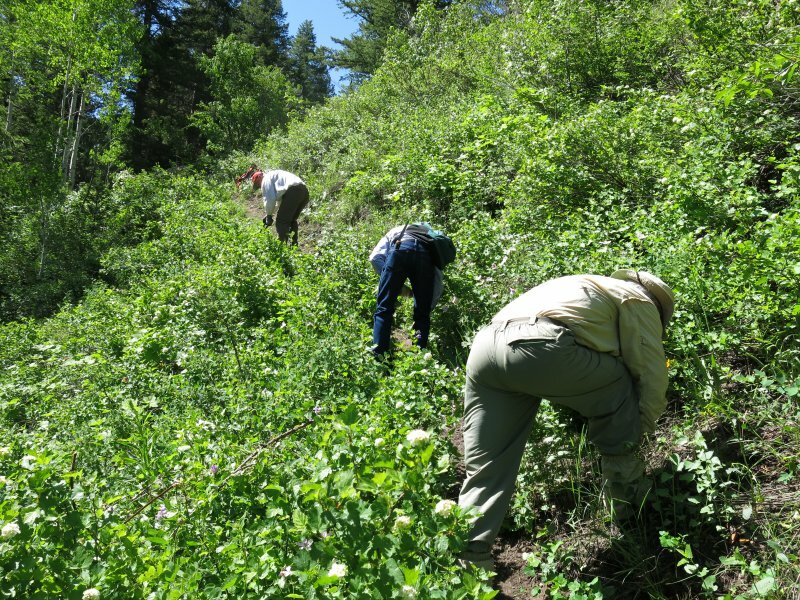 Remove weeds along trails and keep animals and people away from infested areas. Do not drop seeds on the trail after picking them from clothing and fur. 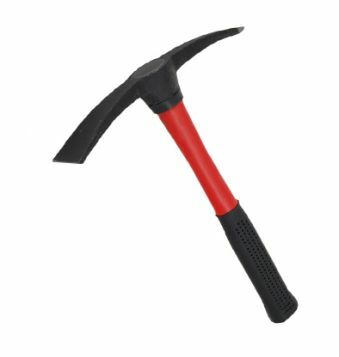 Houndstongue. Cynoglossum officinale A native of Europe. 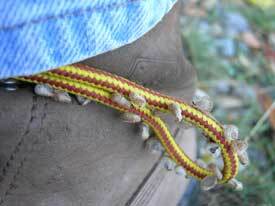 Because of the bur-like seed, it spreads widely along trails as a passenger on clothing or animal fur. It is toxic to livestock. Houndstongue is a one to four foot tall biennial. Basal leaves are about three inches wide with a hairy surface. Small reddish purple flowers form in the upper portions of the stems. 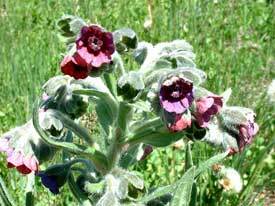 Each flower produces four green bur-like fruits that turn brown as they mature. Bloom is in early summer. Common Burdock, Arctium minus A native of Europe. Burs often become attached to clothing and animal hair and are distributed to new areas. 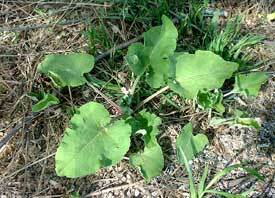 As a biennial, common burdock produces a large rosette the first year which can be two to three feet across. The second year a multi-branched stem grows three to ten feet tall. Flowers are pink to purple borne in bur-like structures.